EditPad Pro's File Navigator can show you a detailed class tree of the Python source file you're editing. The File Navigator makes it easy to find relevant sections of code. The Python file navigation scheme and other provided file navigation schemes are fully editable. The scheme not only builds the class tree. It also makes classes, methods and other blocks foldable with a single click. By folding blocks you can hide lines to get a better overview of the file's structure, making it easier to rearrange blocks of code or navigate between them. 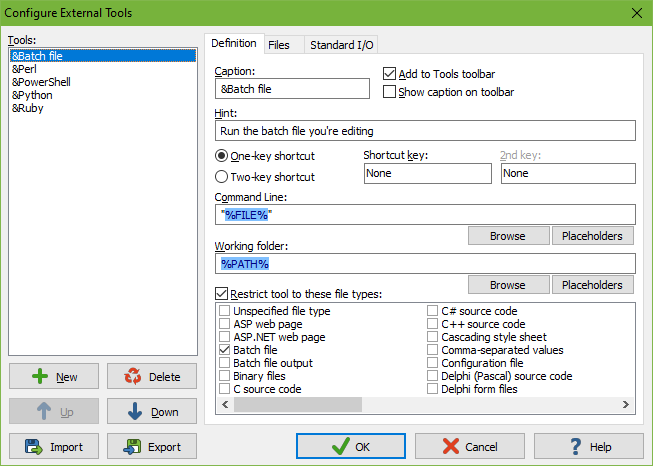 Use EditPad Pro's built-in FTP and SFTP client to upload your Python scripts to your web server right within EditPad Pro. You can even edit scripts directly on the server via FTP, without having to download the Python files to your computer's hard disk first. EditPad Pro transfers files in the background, so you'll never have to wait for all files to download, or for a file you've saved to finish uploading. You can go on editing right away. If you maintain multiple web sites, EditPad Pro can stay connected to multiple servers. With the View|Browser command you can instantly preview the web page you're editing in your default web browser. Add as many alternative browsers to EditPad Pro's Tools menu as you want. With EditPad Pro you can easily maintain very large web sites. There's no limit to the number of files you can open simultaneously. Arrange Python scripts of different web sites into separate projects to open a site's files at once and edit them together. Open all files in a folder (and its subfolders) into a project. Many of EditPad Pro's editing commands can work on all files in a given project at once. Quickly switch between files and projects by clicking on their tabs. Move back and forth with the handy "previous editing position" and "previously edited file" commands. Manage long lists of Python files and large web sites with the handy file manager sidebar which can rename, move, copy and delete files. EditPad Pro's Clip Collection makes it easy to keep a list of Python code snippets at your fingertips, ready to be inserted into your Python source code. Such a snippet can be a Python statement, a block of Python code, or anything you want. Clips can consist of "before" and "after" parts to be inserted around a selection, which is very convenient for inserting block statements or an opening and closing HTML tag pair around a selected block. Record and play back keystroke macros to reduce repetitive tasks to a single key combination. Record a search as part of a macro to instantly edit all search matches in any particular way. Save any number of macros to build your own library of high-octane text editing wizards. Any menu item or keystroke can be recorded. Quickly comment or uncomment code with the Comment, Uncomment and Toggle Comment commands. They even work with rectangular selections, allowing you to insert or remove comment characters at specific columns. 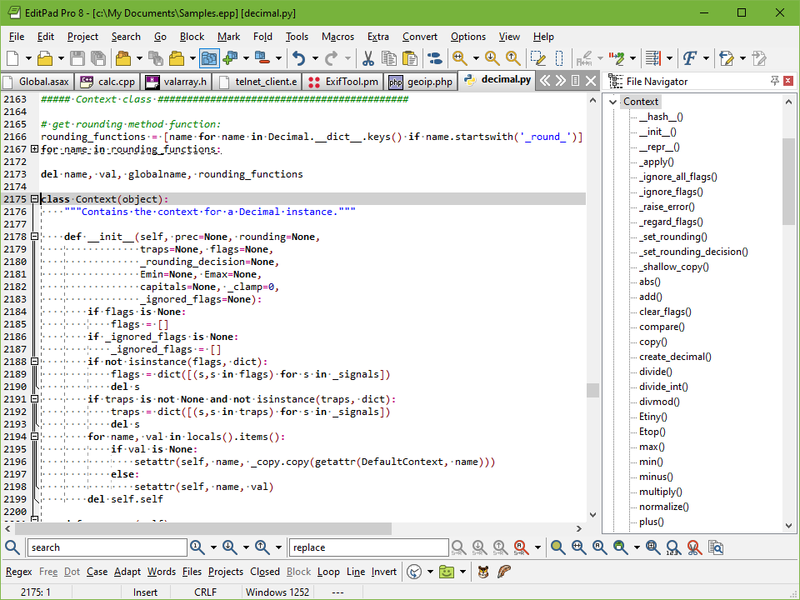 Editing a Python script with EditPad Pro. The File Navigator is docked to the right. "I just wanted to let you know that I'm very happy to have bought EditPad Pro. I have been an UltraEdit user for a few years now, and while UltraEdit is undoubtedly a very good editor, I found it lacking in two areas that I care about, namely Python programming support and regular expressions. I only started using EditPad Pro yesterday, and already I'm hooked. "Your backup concept using a hidden history is great! There are many other things I admire, most of all the care and thought that went into the support for all those programming languages. And of course the genius to have everything regex-based." Use EditPad Pro's extensive abilities to invoke external applications and scripts to extend EditPad Pro's functionality with Python scripts. EditPad Pro can pass the file name of the file you are currently editing on the command line to the Python interpreter or your Python script, or even send the file to the script's standard input. Your script can then read from standard input, do its job, and send the results to standard output. EditPad Pro can capture the standard output into a new tab. 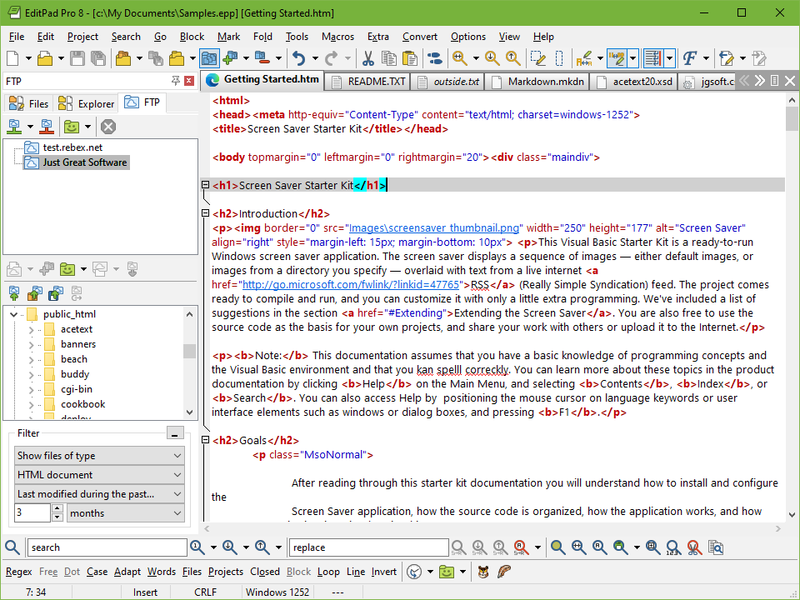 You can even write a script that only works on the selected part of the file you are editing. EditPad Pro will save the selection into a temporary file, pass it on the command line to the script (use %TEMPFILE% on the command line for the tool), and replace the selection with the modified contents of the file after your script has finished its job. That way you can easily add whichever text processing feature you want simply by implementing it in a Python script.